If we ever question why we do it all -- run for hours and hours and hours no matter what the conditions, no matter how we feel -- the answers are in Glenn Tachiyama's photos. Unlike many of the churn and burn sports photographers on the running circuit, Tachiyama not only sees the poetry of ultramarathoning, he captures it with photos that bring together technical mastery, a great eye for nature, and an understanding of what it means to be an athlete in the middle of an epic effort. At times, his photos even seem to turn the suffering into the sublime, a feat even more impressive given that he often captures images of over 200 individual runners at a single race. This is all build up to the launch of the 4th edition of the "Tribute to the Trails" wall calendar, which is built on Tachiyama's outstanding photos. The calendar started shipping to stores today (retail $18.00), and a sneak peak is available at: www.pbase.com/gtach/2009calendar. Outside of some Oregon and Washington running stores, the best the place to find a copy is online at: Zombie Runner. 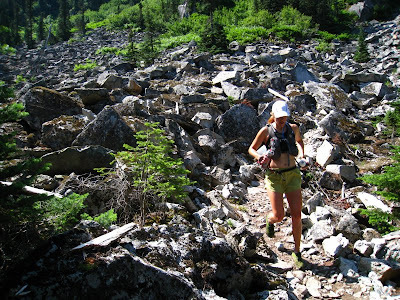 All proceeds from the sales benefit the non-profit Washington Trails Association.